South Minto, Victoria Island (71.10N 117.42W) eastern range of breeding site of Thayer's Gull. Breeds on cliffs and rocky islands in Canadian High Arctic. 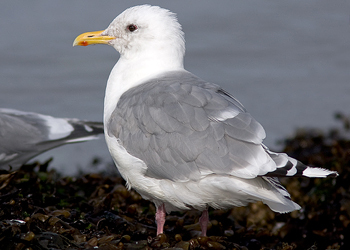 Adults winter mostly along or near the coast at bays, estuaries, and river mouths; first-cycle birds (and, to a lesser extent, other ages) also occur at lakes, duck ponds, dumps, parking lots, and other habitats where large gulls occur. 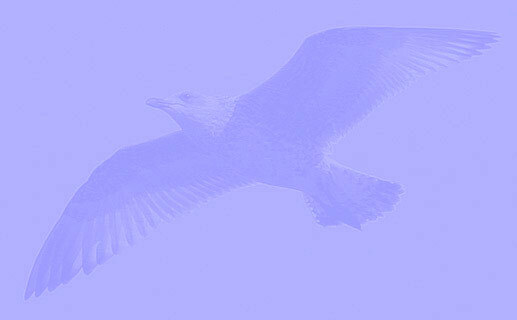 Nonbreeding birds (especially adults) often in flocks (locally up to a few hundred birds but more often 20-100 birds). 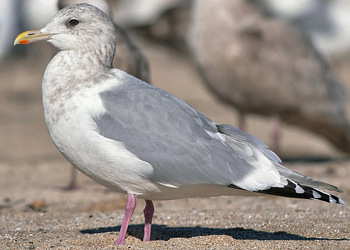 Thayer’s Gulls associate readily with other gulls and water birds but, at least in winter, they mostly avoid feeding areas dominated by the larger Western and Glaucous-winged Gulls. 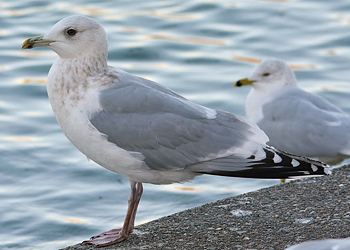 First-cycle birds often associate with groups of California Gulls at town and city parks with lakes, where they can be quite confiding. In winter, feeds on spawning fish in inshore waters and bays; also scavenges. 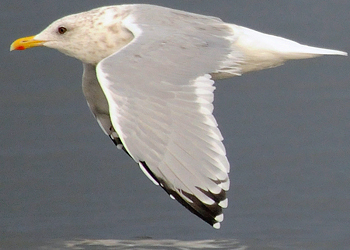 Some adult and third-cycle putative or presumed Thayer’s Gulls have slaty gray wingtips and others have mostly whitish wingtips with limited gray markings. [Parmelee & MacDonald 1960; Snell 2002] Some first-cycle and second-cycle Thayer’s-like birds have pale brown wingtips and reduced dark pigmentation in the flight feathers. 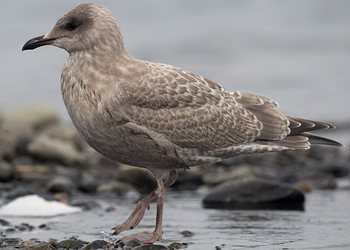 Some of these are probably hybrids with Iceland and Kumlien’s Gulls, but some may represent variation in pure Thayer’s, the limits of which have yet to be established. Complete PB molt (June/July-Nov./Jan.) 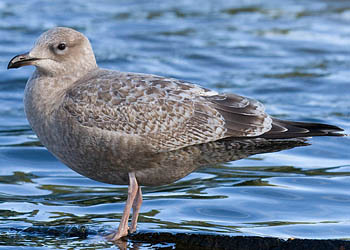 produces adult basic plumage: head, neck, and underparts white; head, neck, and sometimes upper chest with variable (usually moderate to heavy) dusky mottling and streaking. Upperparts pale gray (Kodak 5-6) with slaty blackish wingtips (black on outer web of P10 and sometimes P9 extends to primary coverts; P4 and sometimes P5 unmarked); white scapular and tertial crescents; and white tips to outer primaries. Uppertail coverts and tail white. White trailing edge to secondaries (often hidden at rest) and inner primaries breaks into discrete white tips on outer primaries; P5/P6-P8 have white tongue-tips and blackish subterminal bands, P9-P10 typically have white mirrors or mirror-tongues; on P9, blackish on medial portion extends onto inner web, and an unbroken narrow blackish line runs along outer web across mirror region; P10 usually has a partial to complete blackish subterminal band. Underwings show pale smoky gray remiges with white trailing edge to secondaries and inner primaries continuing as a band of white tongue-tips and mirrors across outer primaries, a narrow slaty blackish subterminal band on outer primaries, and a dark leading edge to P10. Eyes brownish to pale lemon, orbital ring purplish pink. Bill yellowish (often greenish basally in winter) with orange-red to red gonydeal spot and sometimes a dark mark at gonys. Legs pink, perhaps duller during height of PB molt. Partial PA molt (Oct.-Feb./Apr.) produces adult alternate plumage: head and neck clean white (rarely before Mar./Apr. ); white primary tips can be lost through wear. By spring, orbital ring brightens, bill brightens to lemon yellow with red gonydeal spot and lacks dark distal marks, legs rich pink. Thayer's Gull adult, mid-January 2014, central California (Amar Ayyash). Purple orbital ring. Small red gonys spot on lower mandible; much black on both mandibles and cutting edge. Greenish yellow base of bill. Speckling: 25-50%. Primaries blackish. Obvious black markings on P5. Probably younger adult (4th/5th cycle?). Thayer's Gull adult, mid-January 2014, central California (Amar Ayyash). Purple orbital ring. Small red gonys spot on lower mandible. Pinkish base of bill. Speckling: 75-99% (overall grey-brown iris). Primaries blackish. Thayeri pattern on P10 (see underside). Thayer's Gull adult, December 30 2011, Tukwila, WA (Amar Ayyash). Dark iris, purple orbital ring. Saturated yellow bill. Note large white tips on tertials. Thayer's Gull adult, September 27 2008, Clover Point, BC (Robert Doiron). Complete moult: P6/P10. Dark iris. 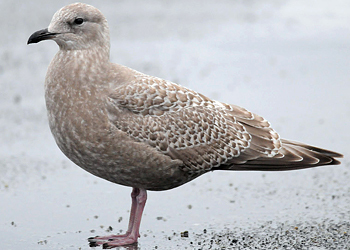 Thayer's Gull adult, October 28 2011, Clallam Co, WA (Steven Mlodinow). Primaries are nearly fully grown out, base of bill is pale straw yellow, head streaking fairly crisp. Eye is dark. 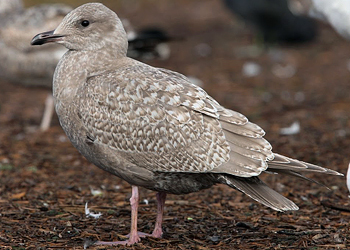 Thayer's Gull adult, October 28 2011, Clallam Co, WA (Steven Mlodinow). P8/-. Bill rather vivid yellow. Birds like this can be hard to distinguish from GW x Herring Gull, especially as some have paler eyes and more smudgy head/chest markings. 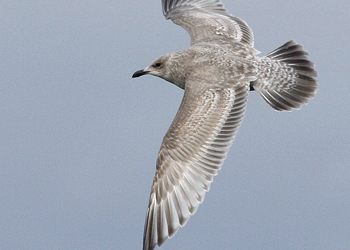 Thayer's Gull adult, October 06 2012, Off Newport, OR (Greg Gillson). Last phase of complete moult, P7/P10. No large moult gap in secondaries, but tail seems to be in moult. Broken band on P5. Thayer's Gull adult, January 01 2012, Seattle, WA (Amar Ayyash). Thayeri pattern on P9. No black on P5. 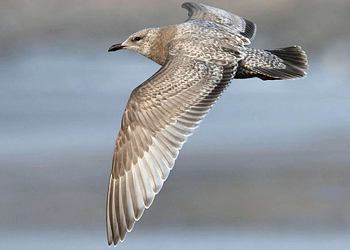 Juvenile (Aug.-Apr. ): dark brown to medium gray-brown overall. Head, neck, and underparts variably streaked and mottled whitish, becoming whitish on vent and undertail coverts, which have broad sooty brown bars. Upperparts with buff (bleaching to dull whitish) scaly and notched edgings and markings, the greater coverts sometimes with lightly marked (or unmarked) bases. Upperpart markings typically scaly to checkered, often fairly contrasting and neatly marked, or frosty in fresh plumage (through late winter on some birds). Uppertail coverts whitish with strong dark barring. Tertials dark brown to dark gray-brown with notched whitish tips and distal edging. Wingtips blackish brown, contrastingly darker than tertials (and usually darker than tail), with whitish fringes or tips usually distinct. Pale panel on inner primaries distinctive on spread upperwing; outer primaries blackish brown with paler inner webs reaching shaft and forming a two-tone pattern that merges inward with pale inner primary panel. Secondaries dark brown, tipped whitish. Outer primary coverts plain brownish with narrow whitish tips. Tail dark brown, usually slightly paler than wingtips with whitish tip and whitish ribbing on outer web of R6: whitish basal barring on outer rectrices best seen when tail fully spread or from below. IN FLIGHT: brownish to gray-brown overall with dark outer webs to outer primaries (varying from a solid panel when wings not fully spread to a two-tone pattern when spread), pale inner primary panel, contrasting dark secondary bar, and broad dark brown distal tail band; underwings medium brown with underside of primaries often reflectively pale. Eyes dark, bill blackish, usually with variable dull flesh on basal two-thirds by early winter; legs flesh to flesh pink. PA1 molt (Nov.-May, does not include upperwing coverts) produces first alternate plumage: head, neck, chest, and flanks smoky gray to sooty gray with variable whitish streaking and mottling, and often mixed with bleached juvenal feathers (juvenal head can bleach to mostly whitish). A1 scapulars range from brownish gray to medium pale gray, typically with fine dark bars or wavy markings and ranging from fairly plain grayish to having dark bars or anchor patterns. Bill blackish with dull flesh to flesh pink basally, sometimes a fine pale horn tip; exceptionally flesh pinkish with a blackish distal third [Howell pers. obs]; legs flesh pink; eyes dark. Note that some birds retain most or all juvenal plumage through Apr. and can be very bleached, almost whitish in overall appearance, but note dark secondary bar and brownish tail, usually fairly protected from bleaching. Thayer's Gull 1st cycle, September 10 2012, Teslin Lake, Yukon (Yukon Bird Observatories). Juvenile plumage. 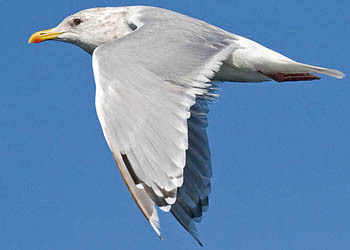 Thayer's Gull 1st cycle, December 2009, California, US (Chris Gibbins). Juvenile plumage. Note extensive dark tertial centres, pale crescents on primary tips, and extensive dark central tail-feathers. Starting to develop paler base of bill. 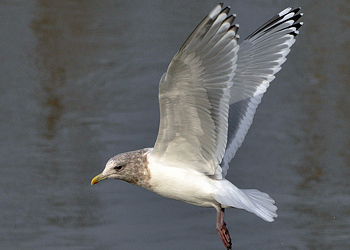 Thayer's Gull 1st cycle, December 10 2011, Everett, WA (Steve Mlodinow). 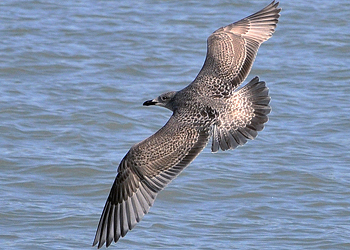 Juvenile plumage. Black bill. Extensive dark tertial centres and pale crescents on primary tips. 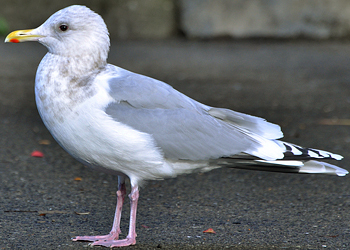 Thayer's Gull 1st cycle, February 19 2011, Portland, OR (Greg Gillson). By February still in juvenile plumage. 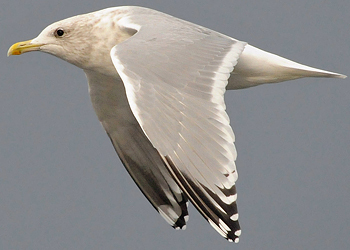 Thayer's Gull 1st cycle, October 27 2013, Chicago, IL (Amar Ayyash). Juvenile plumage. Pale window on inner primaries which continue to the inner webs of the outer primaries. Lack of dark pigmentation on the inner web tips of P1-P4, with just a bit of faint darker on P4. Thayer's Gull 1st cycle, November 05 2011, Chicago, IL (Amar Ayyash). Juvenile plumage. Pale window on inner primaries which continue to the inner webs of the outer primaries. Lack of dark pigmentation on the inner web tips of P1-P4, with just a bit of faint darker on P4. 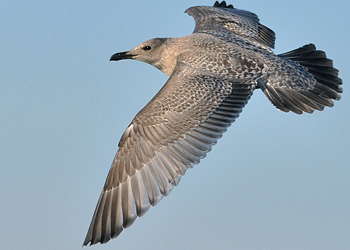 Thayer's Gull 1st cycle, December 2009, California, US (Chris Gibbins). Juvenile plumage. Note extensive dark central tail-feathers and pale window on inner primaries. Black bill. Note dense brown collar. Thayer's Gull 1st cycle, February 16 2010, Winthrop Harbor, IL (Erik Bruhnke). Note pale windows on inner primaries which continue to the inner webs of the outer primaries. Also note the lack of dark pigmentation on the inner web tips of P1-P4, with just a bit of faint darker on P4.